He has had the privilege of rubbing shoulders with countless legends and held some of the biggest jobs in the game...from Chief Executive of the FA to Editor of Match of the Day. Perhaps the only job he hasn't done is pull on the shirt of his beloved Liverpool Football Club (although he did once score a diving header on Copacabana Beach). This is a remarkable journey from the terraces of Anfield to the corridors of power at Soho Square. As a BBC boss he worked with Jimmy Hill and Des Lynam, gave Alan Hansen and Gary Lineker their big breaks, clashed with Sir Alex Ferguson and made Pavarotti a surprise World Cup hit. A controversial switch to ITV followed, his friend Des joining him there. They gave the nation an early evening Saturday football show - for a few weeks. Then there was the FA. 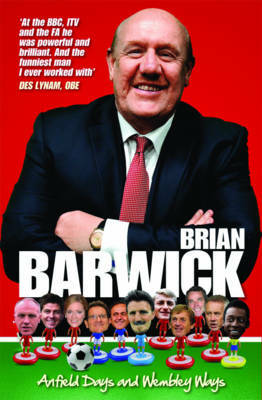 Barwick oversaw the completion of the new Wembley stadium and went on to hire Capello - and McClaren - before leaving for his next adventure. Throughout it all, he never lost his passion for the Reds. Growing up with greats like Shankly, Paisley and 'Sir' Roger Hunt saw to that. This is a warm, witty and sometimes poignant tale of a footy-mad Kopite who climbed to the top of the soccer ladder. There's an access all areas pass waiting for you. Join him in a celebration of our beloved game.